Sharon has been extremely busy of late, two Huge projects pretty much owned her time over the last month. The book, finally released by Brick Cave Media, features the tremendous Haven stories by Sharon, Bob Nelson, Nick Ozment and J.A. Giunta. Nine stories in all are included, with The World Is A Cold, Hard Place having a central role in the book. It introduces one of Haven’s central characters. Check out a copy today! 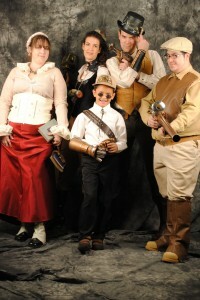 For the 2011 Phoenix Comicon, Sharon participated in the Steampunk Fashion Show, as well as sitting on a panel for Steampunk costuming as well. Aside from easily having the most diverse collection of costumes, she also provided insight into “repurposing” items to make costuming easy.